We recommend you to read this information only after you have read the main information about Pixel Control work. Alternative image creation. For each event, corresponding to Pixel Control, you can create unlimited number of alternative images in addition to the existing main one. To do this, choose the last variant in the list of images , press and then perform the same actions as for the main image creation. During the Replay AutoClickExtreme will search for all the images one by one, beginning from the main one (within one event). As soon as at least one image is found during the set search time, the needed mouse click will be made (if you made it during Record), then AutoClickExtreme will pass on to the next following event. You can use it, for example, in a program you automate, if the interface changes - for each interface you can create an alternative image without rerecording the task. Or if one interface element is replaced by another (which doesn't require more than one mouse click). 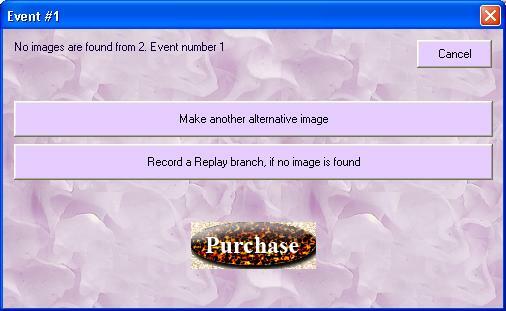 If you want AutoClickExtreme to carry out special actions when the image is found, use the unique technology of Replay branches: for each found image you can create a separate Replay branch, which will accompany the image found on the screen. 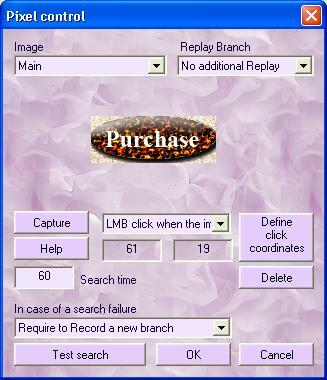 To do this, in the drop down list "Replay Branch" choose the item "Require to Record a new branch", or choose one of already created branches, if a similar task has been already recorded. AutoClickExtreme will require to Record a new branch, when during the next Replay the corresponding image is found. You can start this Replay by making a right mouse button click (in the table of events) on the event corresponding to the needed Pixel Control and choosing the menu item "Play selected event(s)"
AutoClickExtreme will search the images listed in the chosen Pixel Control. When it finds the image, for which a new Replay branch should be made, AutoClickExtreme will show this dialog box. When you click on the button AutoClickExtreme will start Recording, and you should perform the actions which will be recorded into the new Replay branch. So, for each event with Pixel Control you can create unlimited number of alternative images, for each of them you can create an additional Replay branch. 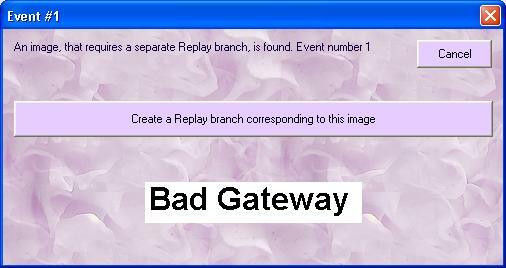 Moreover, in case no images are found, you can make a separate Replay branch. In this case, you can choose the needed event in the list, which you see at the bottom of the Pixel Control editing dialog box. if you choose this button, AutoClickExtreme will start recording the events, which will be replayed only in case no Pixel Control images are found.